Wow! Where to start. How to describe how much we loved this place… Ahh! We shared a tour boat with 2 chinese people. We took more pictures than them. That should get the point across. 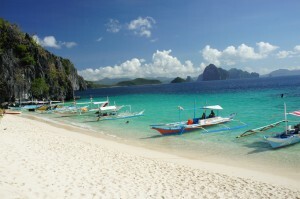 El Nido on the island of Palawan in The Philippines has to be the most beautiful beach area in the world. I felt like I was walking in a Sandals commercial, only prettier. 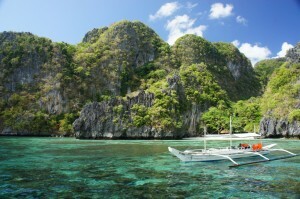 El Nido is in a natural harbor surrounded by large, green cliffs. The town was busting at the seams with activity. The beach wasn’t all that great so we opted to stay in the cheapest place we could, to save money for tours. We found a guesthouse with a nice private room. The owner was friendly and everything was clean. We dropped off our stuff and practically ran into the streets. The beach was lined with restaurants, bars, and cheap hotels. 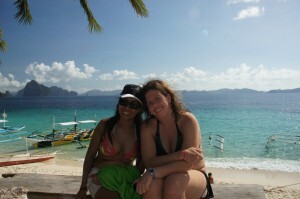 We met a girl from Boston who was stationed here through the peace corps. She was working with the local government to develop sustainable tourism in the city. So we asked her which tour agency to use and which restaurants to visit. We always try to patronize locally owned restaurants and hostels whenever possible. She recommended an amazing place for dinner and a friendly tour agency. The food here was great: full of spice and flavor. We had adobo chicken and vegetable curry. Adobo is a special sauce here made with soy sauce, garlic, onion, lemons, and some kind of oil. Or maybe the slight bitterness comes from tamarind instead of lemon, but either way it is delicious. I love it. It adds so much flavor to whatever it is put on and has been a foolproof dish time and time again. Our waiter was the owner’s son. About 6 years old but professional and friendly. During the day he goes to school, but at night he helps the parents run their restaurant “BlueAzul.” redundant name, but great food. We went to bed kinda early, still on an “early to wake, early to bed sleep” schedule from the time shift. Plus we were super excited for the tour. For $25 we got a full day tour for the two of us with a BBQ for lunch and a boat with only 2 other people. Can’t beat that. They looked cool, but were a bit loud. The engine sounded like a guy was taking a metal hammer and smashing it against an anvil. And he was in a cave. But it got us from island to island so it did its job. Ok, so enough typing. Here is us leaving shore. Headed out for the day. Ten minutes into the trip, approximately picture #50. We saw this cool boat parked in the harbor. Then we got to some of the cliffs. They were huge! and as always pictures do not do justice. 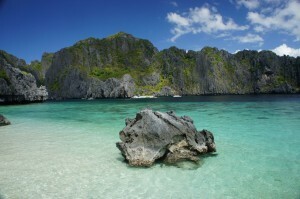 Here is a picture of an enormous cliff with a hidden beach complete with beach hut. We saw a couple kayaking. Tell me this doesn’t look like a tour book ad. By the way, we are at approximately picture #200 at this point. 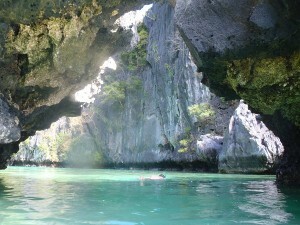 We headed to our first stop, “The Small Lagoon.” On our way there we went through this waterway, surrounded on each side by cliffs. The engine was turned off. 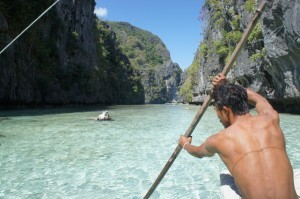 (thank God) And one of our guides started paddling toward the small lagoon. 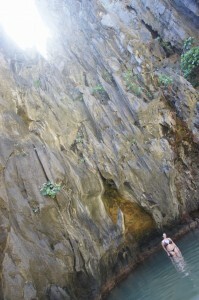 The boats stopped, we jumped out (snorkel in hand) and went through this rock archway to get into the small lagoon. 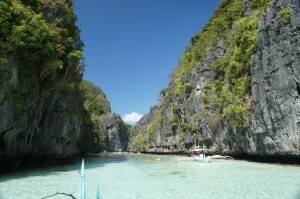 Inside was a lagoon of crystal clear water, reefs, tropical fish, and corals. Basically pure natural beauty. 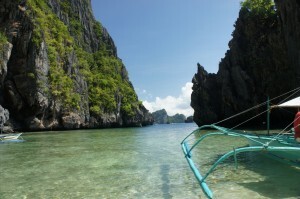 We snorkeled in there for an hour or so then headed back to the boat. 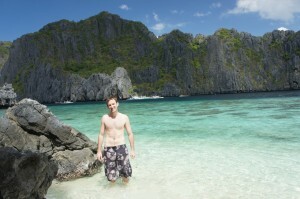 After the small lagoon, we headed to the big lagoon. The big lagoon was cool. 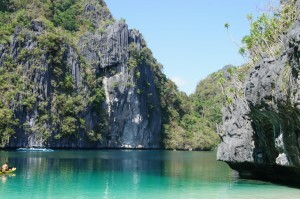 But not as impressive in my eyes as the small lagoon. 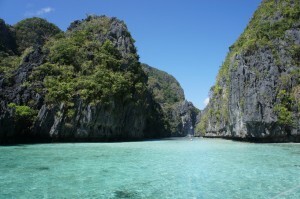 It was big enough to allow passage with the boat so we just sailed around it without leaving the boat. Then we drove out of this beautiful waterway to our next destination. We paddled past this boat at anchor. The water is crystal clear. 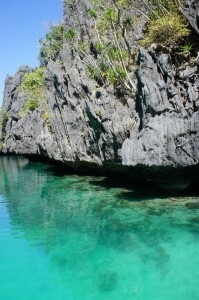 The dark bits you see under the water are coral reefs. Unphotoshoped actual photo. National Geographic please see our facebook page for contact details. We parked our boat at this beautiful beach for lunch. 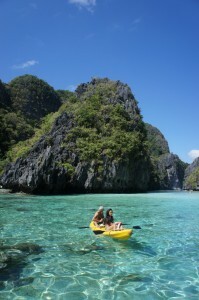 While the guides prepared the feast, we snorkeled around in the reefs, took pictures, and enjoyed our time on cloud 9. We are at picture #400. 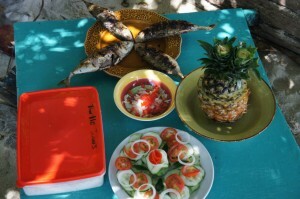 We enjoyed this BBQ lunch, prepared on the island by the guides. 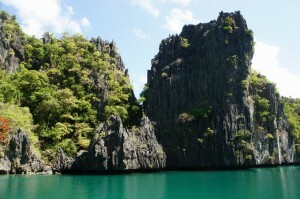 Then we got back on the boat and went down another beautiful waterway on our way to the secret cove. The secret cove looked like a movie set. It was spectacular. Here is a picture from the beach. 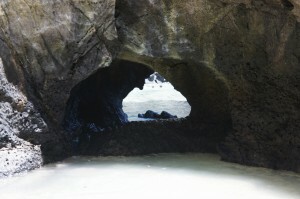 We swim-crawled through this hole in the cliff to get to the cove. I call it swim-crawling because it was crawling, until a wave hit then it was swimming. We headed to our final stop on the tour “7 Commando Beach.” We ran into a couple we met in line at the Underground river in Sabang. They were super friendly and helpful. 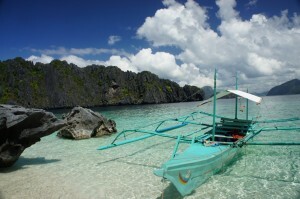 We saw them everywhere we went the couple of days we were on Palawan island. We couldn’t have asked for nicer friends. 7 Commando beach was amazing. Here is another great shot (picture #700). At the beach they sold coconuts for a fraction of a dollar. I’m not a big fan of coconut water. But, there was a mound of spent coconuts. 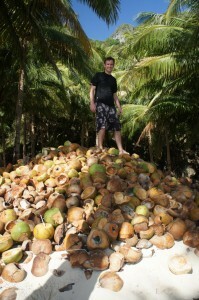 What to do if you see a mountain of coconuts?… Climbing it is the only option. 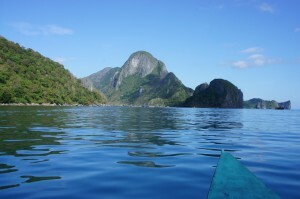 Camera batteries empty, we reluctantly headed back to El Nido after an amazing day island hopping and exploring some lagoons and beaches. Our boat man told us that the boat was to be used in the hollywood film “Borne Legacy” that was being filmed in the big lagoon whilst we were there. The boat was meant to have an action scene and then be blown up. If so i hope that Matt Damon and co didnt damage any coral in the process. Very cool. 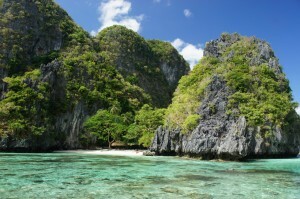 will be interesting to see the film and which parts of el Nido they picked. 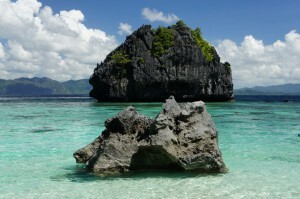 Here is my curation site about coconuts as promised. thank you! The crickets… We had to take a couple deep breaths before those guys. But they ended up being pretty good. Hey guys, your pictures are amazing! 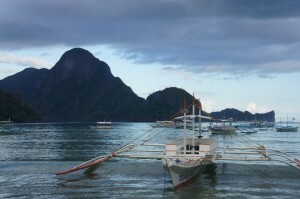 I am heading to El Nido in June and I was wondering if you could recommend any cheap accomodation in El Nido and maybe the place where you booked your island hopping tours? 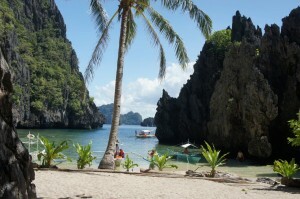 We really liked El Nido, I went twice and I discovered nacpan beach at the second time i visit there. it was really nice too!